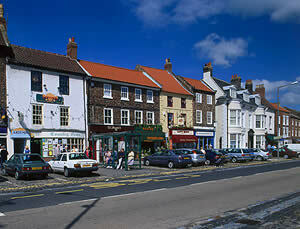 Living in the Region: Browns Estate Agency, Property Estate Agents in Teesside and Darlington. With miles of spectacular coastline, dramatic countryside, acres of ancient woodland and exciting urban towns Tees Valley is a fabulous place to live. Beaches in Tees Valley are perfect for relaxing but offer so much more. Explore a quaint fishing village nestled between towering cliffs. Treat yourself to freshly caught fish or crab in a traditional seaside pub or restaurant. Once famed for hanging a monkey as a spy in the Napoleonic wars, Hartlepool has turned its enterprising spirit into creating the perfect day out at its stylish Marina. And Stockton Riverside has been redeveloped and has fun packed summer festivals. Whoever said "it's grim up North" had obviously never come to Tees Valley. We challenge you to stand at the top of Roseberry Topping and not be impressed. Which view will you choose as your favourite? The endless moors stretching away as far as the eye can see behind you? The glint of the sea to your right? The green fields of the Valley as it disappears towards the Yorkshire dales in front of you? Or the majestic rugged outline of the Cleveland Hills winding their way to your right? You can walk, run, drive, cycle or sail through the Tees Valley, across windswept moors, through forestry land, even cruise along the River through picturesque fields. A little bit of what you fancy does you good, so they say. Indulge yourself in one of Tees Valley's shopping treats. Lose yourself in designer splendour in Middlesbrough's trendiest streets, packed with fashion houses, bars and cafes. Or stroll along the cobbled high street of the historic village of Yarm, discover quirky antique emporiums and individual boutiques packed from floor to ceiling with the latest in art, fashion, house wares and jewellery. Slow the pace at one of our market towns, Darlington or Guisborough where even on market days you can still sense the atmosphere of a laid back country town, with its abundance of local home grown produce and its array of quirky stores. Captain Cook (not Captain Kirk) was the first man to "boldly go" (a quote from Cook's log) leaving his home of Middlesbrough to discover South Australia and circumnavigate the globe. Immerse yourself in the treachery of life at sea in the 18th century on a Cook country tour. Known for its maritime history, Tees Valley also claims another pioneering "first" - the birthplace of the passenger railway. Experience the excitement of the steam railways on a North East train trail. These industries changed the landscape of our region and the world forever. The reason for so much momentous change was simple and can still be seen today "wending its way slowly to the sea" the River Tees. How true the poet who said "there is no more fascinating pastime than to keep company with a river from its source to sea", today you can follow the River from its wild and windswept origins high up in the North Pennines at the Tees head down to the golden sands of the estuary.